A value creating supply chain of physical products involves several actors in the fields of production, logistics and traffic. The diversity of these stakeholders often leads to unplanned disruptions in the chain. Industrial production plants, especially those set up according to the principles of lean production, suffer severely from disturbances. One approach for at least partially absorbing the effects is raising the overall flexibility levels within production itself. 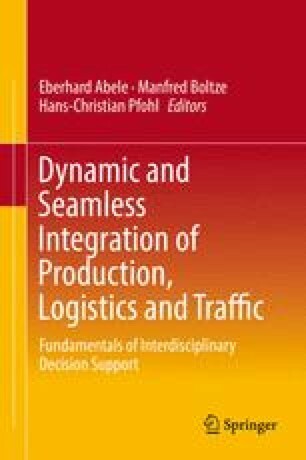 The focus of this chapter is thus set to how flexibility can be leveraged in lean production systems to deal with disturbances resulting from fluctuations in logistics and traffic. The chapter starts with the identification of flexibility requirements using the fault-tree analysis method. Following this, a closer look at the term “flexibility” itself in manufacturing contexts as well as at the different types of flexibility will be taken. Volume and mix flexibility are identified as the types most relevant for industrial companies. Thus, different models for measuring volume and mix flexibility in the literature will be reviewed. The chapter then turns to the actions for increasing flexibility in production systems and presents selected technical, organizational and human approaches. The focus is from then on set to lean production systems and their special conditions and prerequisites. First, selected approaches for addressing volume and mix flexibility in lean assembly systems will be discussed. Afterwards, the innovative concept of Cellular Manufacturing as an approach to transfer the ideas from lean assembly to lean machining will be introduced and volume and mix flexibility advantages due to the Cellular Manufacturing concept will be presented. The chapter concludes with a cost comparison of Cellular Manufacturing versus complete machining. Matzka, J., Di Mascolo, M., & Furmans, K. (2009). Buffer sizing of a Heijunka Kanban system. Journal of Intelligent Manufacturing. doi: 10.1007/s10845-009-0317-3 (Published online Sept 2009).